The concept of ascension or the evolution of consciousness to a higher state of being has become a point of interest in modern times. But these ideas are hardly new. William Henry has spent over 20 years studying ancient art and mysticism compiling an extensive body of evidence suggesting that ancient peoples were also keenly interested in the topic of ascension. 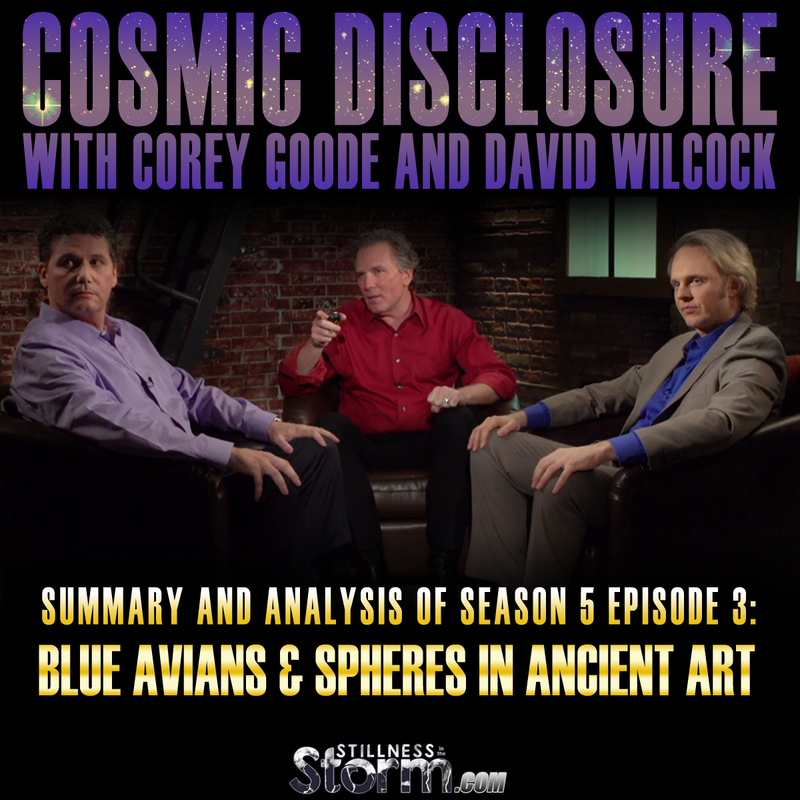 In this special episode of Cosmic Disclosure, Henry joins David Wilcock and Corey Goode as they review works of art that correlate to the Blue Avians and Spheres described by Goode in his testimony. In the process, a great many correlations to ancient figures, traditions and myths are drawn, inferring that the Sphere Beings have been interacting with humanity for all of known history, including epochs of the deep past that have yet to be acknowledged by mainstream historians. Henry begins this tour of the ancient world by reviewing a pictograph relief from the Temple of Horus, where we find a rendition of the son of Osiris in a traditional light bearer configuration. Henry points out the fact that the carving was once painted over with the color blue, highlighting one correspondence between the Blue Avians and this ancient deity. 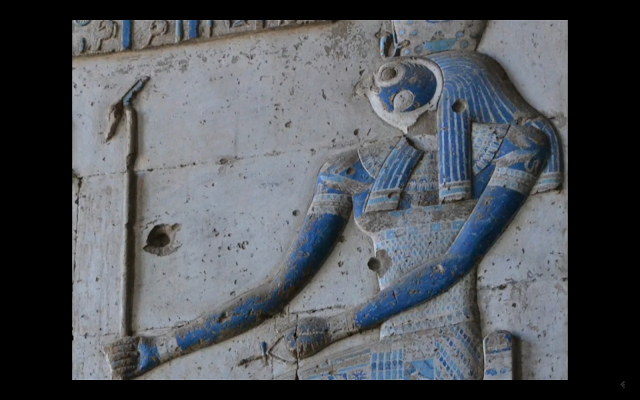 At another site, the Temple of Hathor, an even more, overt connection is made to another rendition of the god Horus. 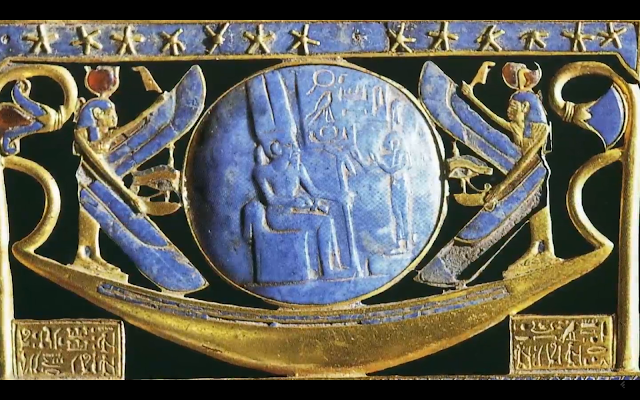 Here, the relief is clearly painted in blue as Horus is sitting atop the "throne of ascension," as Henry refers to it. This throne is a common element in many works, as is shown below, and represents the fact that the occupant is of a high order of being. In this instance, Horus is acting as the judge of souls, holding the Staff of Resurrection in one hand and the Key of Life or the Ankh in the other. These symbolically suggest that Horus is representative of the spiritual agency that watches over the death and rebirth cycle on Earth, which have been called Guardians by some cultures, such as the inner-Earth peoples. In another piece depicting the judgment of souls, a godlike figure is seen sitting on the Throne of Ascension while a human being of lesser stature stands in front. The symbolism of the blue sphere suggesting a portal, gateway or stargate is more clearly depicted here, which Wilcock and Goode obviously recognize. The Arch of a Million years, as it is called, represents a realm in the heavens where this grand task of judging souls and sending them to their next incarnation takes place. This is the first image shown by Henry wherein the presentation is suggestive of a portal or aperture, a window into a realm normally hidden from sight. Henry suggests that these beings are vibrating at a rate which prevents them from normally being seen by human eyes. The blue sphere represents a portal or opening into this world of a higher vibrational energy, where the "gods" reside and watch over humanity. At this point, Goode says that he has traveled about using blue spheres that appear in a room, expand around his body and whisk him away to a desired location, all under the direction of some higher order of intelligence. Goode has said in the past that one of the Sphere Being Alliance races are the Blue Orb beings, which seem to be in charge of transporting him via the blue spheres. The next image is that of the risen Christ, depicting Jesus on the Throne of Ascension surrounded by a blue sphere like orb with a stylized border of blue bird beings or avians. The same thematic elements of an ascended being gazing through a portal into our world are illustrated within the work. 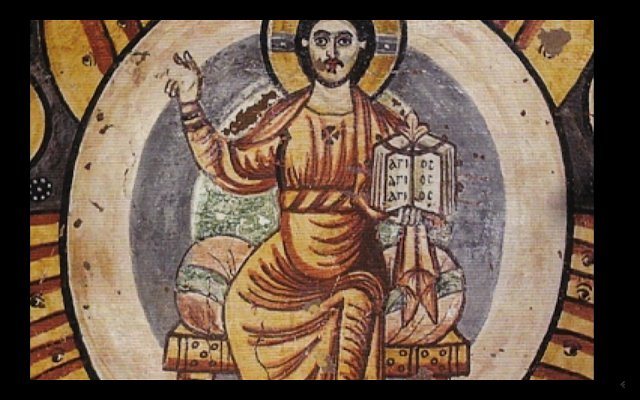 Henry states that the early Christians were persecuted by the powers that be at the time and resorted to hiding deep esoteric teachings in imagery and pictographs. The same method of hiding the truth in plain sight was used by many other cultures and later deciphered by certain elite families who sought after the keys to personal evolution and immortality. One of these families was the Medici's of Italy. According to Henry, they spent an enormous amount of money searching for these mystery school teachings of old and finally found the Corpus Hermeticum through their efforts. This work is a branch of the ancient teachings once given to the peoples of Egypt, led under the direction of Thoth and others, according to legend. The same core truths have been woven throughout almost every culture in the ancient world, suggesting that the mystery schools of old have a unified common core or basis. The Medici family gave certain teachings to esteemed artists at the time, such as Sandro Botticelli, Michelangelo, and Fra Angelico, who also hid these teachings within their own works for similar reasons. But the majority of these esoteric art pieces, according to Henry, are credited to anonymous artists who did not want fame to distract from the message of their works. Wilcock states that the original teachings handed down to the Egyptians, according to the Law of One and Edgar Cayce readings, were positive in nature. And it appears, based on the artworks cited by Henry, that the same core teachings have been woven throughout history, depicted in works of art and studied by both light and dark occult practitioners. Part of these teachings seems to be the understanding that as one evolves and ascends in consciousness, they eventually gain access to these blue spheres, which are gateways or portals to the spiritual realm or the heavens where the gods reside. Henry describes how these teachings are largely unknown to the uninitiated masses, but due to the nature of mind and how it can be affected by symbolism and subliminal techniques, the images still had the power to activate consciousness and initiate the masses. But today, most followers of Christianity are completely unaware of these deeper esoteric connections. In another image, the judgment of souls is depicted using the scales of justice, held by Anubis, wherein the heart is weighed against the feather of Ma'at, a deity personifying the universal spirit or the feminine creator archetype of the cosmos. If the heart weighs less than the feather, the initiate is said to have passed the test, and can now take their place amongst the stars with the gods. A Coptic piece depicting Jesus within a blue sphere is one of the last pieces reviewed by Henry, Wilcock, and Goode. Here the risen Christ is shown holding a book, a reference to law and wisdom, surrounded by angelic beings, and four animal archetypes at 90-degree angles to each other. These archetypes represent the four fixed signs of the zodiac (Aquarius, Torus, Leo, Scorpio) which are the points of the calendar year when the Solar influence of the season is at it's maximum. This is a clear reference to astrotheology and the ancient Atlantean mystery school teachings later adopted by the Cabal and hidden within the esoteric side of all major religions. Before reviewing the analysis of the symbolism provided in this episode, a review of the nature of mind and the principles of personality evolution will be helpful. Firstly consider that the mind is the medium or intermediary between the spiritual aspect of one's beingness and the body. The body acts as an antenna or epicenter where the drama of consciousness unfolds, leading to personality evolution, transcendence and upliftment. The spiritual self, existing in a state of fixed or eternal perfection, has been described as the higher self and does not change. The higher self is in a state of potentialized perfection, interacting with the mind by way of catalyzing stimulus from the body, received as sensations, feelings, and emotions. For example, consider that the spiritual quality of fellowship, compassion, and kindness exists as a potential within each personality, but this potential cannot be known to the evolving mind unless activated through experience. In order to actually know that we are capable of compassion, an act of compassion must take place. Through the agency of experience, what is hidden within as a potential becomes actualized as knowledge or wisdom. When one observes hardship felt by another, this provides an opportunity for the spiritual qualities of loving service to manifest as an actual experience in the life of the individual. The body observes the situation occurring outside of oneself, which is received within the mind triggering a response as an interaction between the conscious and subconscious. The spiritual potential, properly designated as unconscious, is activated by a catalyzing event occurring in experience and made conscious within an individual as a possible choice. In other words, experience itself provides a venue for the spiritual potentials latent within each individual to come to the surface, and once done, free will has the opportunity to choose the spiritual way of servicing others. If one so chooses, then the resulting experience causes a change in consciousness that actualizes the spiritual qualities within the evolving soul. In short, experience generates desires (in the mind) which when acted upon change consciousness to become either more spiritual or less spiritual. The difference being, when one chooses an action that opens the mind to more truth, this is spiritual progress; whereas when one chooses an action that closes the mind to the truth, this is spiritual regression or stagnation. Every choice we make, in all moments and at all times, causes us to step towards the mountaintop of spiritual attainment and universal consciousness or causes us to step towards the bottom and the experience of spiritual isolation or separation consciousness. In this sense, the soul is the synthesis between the actualizing evolving mind (conscious) and spiritual potentials in the unconscious. When a being chooses to act in ways which are in harmony with the spiritual realities of existence, which as been described as doing the will of the father or the universal spirit, then that being makes a step towards spiritual evolution. Conversely, when an individual cowers away from the spiritual choice, rejecting the evolution and change in one's beingness that comes with it, that being becomes more material, service to self, or selfish in nature. That is to say, each choice causes us to become more universal and spiritual, or selfish and separated. And the feedback experienced in either capacity further motivates or incentivizes future choices. The tendency is for selfishness to blossom into more selfishness unless a personality transcending event takes place. The role of mind in spiritual evolution is to provide a venue or place where free will has the ability to choose and act, to actually make a choice between becoming more spiritual or becoming less spiritual. Once the choice is made, forever changes the consciousness of the being making it, but steps in either direction can be reversed with new actions. This means that no matter how far we've fallen into darkness, we always have the choice to turn around, begin the return journey into light. The mind has two regions of activity that enable the will to act and make choices. The conscious mind is where free will has the greatest power to act, where objects, events, locations, and beings are recognized, understood, and the corresponding relationships inherent within them form the basis for making a choice based on a logical or rational thought process. For example, if we feel hungry (a physical sensation sourced from the body) the mind generates the desire to eat food, which is then acted upon generating effects which are again felt by the body. This is the feedback mechanism of generation or causality describing how one choice leads to the generation of more choices in a chain or sequence. A desire is birthed from an interaction between the conscious mind (masculine) and the unconscious mind (feminine). The conscious mind observes something which acts as a catalyzer for the potentials hidden within the unconscious mind. In our example, the sensation of hunger was observed by the conscious mind, which triggered the activation of an unconscious potential, the desire to eat food, a fully formed idea. The subconscious mind is the realm of impulse and intuition, where ideas are birthed into the conscious mind as fully formed thoughts. The unconscious mind is that which is completely unknown or that which we are unaware of at any given time. The subconscious acts as a messenger or intermediary between the conscious and unconscious mind, wherein things observed in experience are catalyzed or activated—moving from the realm of unconsciousness to consciousness via the subconscious mind. When observing things in experience, the mind in all of it's faculties produce or generate thoughts, ideas, and images that are presented to the conscious mind for review, where a choice can be made. This simple truth means that everything we know and experience, especially in regard to personal change, occurs at the epicenter of the mind. In case anyone feels as though emotions are taking a back seat in this analysis, let me clarify that they are an intimate part of the evolutionary process. Emotions or feelings are the fruit or product of choice, which we feel through both the material and so-called etheric bodies. These sensations are the feedback produced by our choices, a dynamic interaction between the local environment of the body and the universe at large. In this sense, the mind in its whole form encompasses both intellectual and emotional processes, a unified system which cannot be truly divided. And this means emotions, feelings, and intuitions are a few of the methods the universe itself uses to feed new ideas (catalyst) into the mind, things that we may even attempt to reject or suppress. In short, if it was not for the emotional component of the evolutionary process, the mind could completely separate itself from reality via conscious acts of will. Therefore, attempting to focus only on intellectual or emotional evolution doesn't impart real progress, only the illusion of such. As was discussed above, the mechanics of spiritual evolution is governed by mental processes because free will choice is the ultimate decider or initiator of progress. When we choose, in any capacity, consciousness is altered or changed, and this change causes us to become more like the spiritual higher self or not. Without mind, no choice can be made, and as such, evolution is without a doubt intimately associated with mind and consciousness. This realization that the universe is Mental is one of the seven principles of Natural Law described in hermetic philosophy, which is the conceptual basis of nearly every mystery school or esoteric teaching on Earth. And as we will see in this episode, is connected to Thoth, the Law of One, and the Ascension teachings embedded in the ancient art presented by Henry. This is important to understand because the use of symbolic imagery by mystery schools is based on the catalyzing or innitiating effect of the subconscious mind. Even if one were totally close minded to spiritual realities, by the very nature of the truth, which flows through all things in experience, an inescapable change in one's beingness is sure to occur. But when we reject the truth consciously, subconscious methods of evolution are required, and it is here where symbolism can help crack open even the most close-minded of people. The dividing line for evolution is choice. When one consciously chooses to evolve, they must seek the truth wherever it leads, and this opens the mind to the spiritual catalyzation that is being generated constantly by way of experience. But when one does not consciously choose soul growth, they unwittingly deny their conscious mind an opportunity to properly reconcile and integrate spiritual messages, and as such, the degree or intensity of evolution is greatly reduced. Said another way for clarity, when we choose not to grow, it is a choice to close the mind to the truth, which hinders change and evolution as a result. This also means that once an individual has chosen not to grow or evolve, their conscious mind is incapable of guiding the evolutionary process. As a result, the universe employs a form of subliminal or subtle messaging to activate these potentials by triggering evolution in a subconscious way. In other words, when we refuse to evolve consciously, the universe still offers us change, but now it is received as trials and tribulations. This principle of subliminal or subtle evolution is one of the reasons the Cabal justify their actions. And while one can use subtle techniques to offer wisdom to others, the goal is to always activate the conscious mind to begin doing the work proatively. In the absense of making that choice, positive techniques, such as those employed in symbolic imagery, can be used that do not abrogate free will. This principle of refusing growth and suffering as a result is wonderfully described in the below message from Isis. In the ancient tradition, one who is initiated is one who actually makes this choice to follow the truth wherever it leads. But one who is not initiated has not made that choice, and as such, is seeking to protect their sense of reality (the mind) by ignoring or rejecting information that causes spiritual change. The vast majority of humanity is on the latter course, albeit not consciously choosing personality stagnation. Finally, there are those who willfully choose to remain unchanged despite the realities of spiritual evolution, and it is this latter group which is the most dangerous, as in order to maintain their limited sense of self they must suppress honest truth-seeking within others. In other words, to be service to others means to choose the path of truth and to initiate oneself into the mysteries, whereas to be service to self means to choose the path of separation and falseness and to be initiated into the brotherhood of darkness, so to speak. The ancients clearly understood this dynamic of mind and spirit, and also realized that humanity at present has not chosen to evolve. But there is another side to this story which has not been mentioned in this episode, yet is discussed by Wilcock and will be presumably featured in his new book The Ascension Mysteries. We are discussing the battle between the forces of light and the forces of darkness. In the book, Children of the Law of One and the Lost Teachings of Atlantis, a history is provided which allegorically and literally describes the struggle between those who choose spiritual evolution and those who do not. In the work, the Children of the Law of One are described as those beings who have choosen spiritual evolution and as such are constantly seeking the truth, about themselves and the universe at large. This group represents the Sons of Light, the protagnonists or, in a more ancient appellation, the Great White Brotherhood, prior to this name being coopted by white supremacists in modern times. The following is provided as a way to understand the psychological basis of consciousness for our current state of affairs, and how this struggle has been echoed throughout every period of human history. I make no claims as to it's authenticity, but like all allegories, it can offer us understanding without having to be accepted as literal truth. Much of what is described below is also echoed in the Law of One Ra Material, the Emerald Tablets of Thoth the Atlantean, the Fall of Atlantis as told by Archangel Metatron and many others, to name a few. Within the history provided, the Sons of Belial are the antagonists who do not choose spiritual evolution, and as such, have chosen the path of separation leading to selfishness, oppression and enslavement of others. Due to the nature of truth, symbolically described as light, the mere presence of truth can shatter the most securely founded illusions; a single candle flame can blot out all darkness within a room. What this means is that those who choose evolution become poison or destructive to those who do not, and as such, those on the path of separation must enslave and oppress the children of light else their fragile sense of materialistic reality would be shattered. The Children of the Law of One passed down the story of the creation of humanity from elder monk to elder monk throughout oceans of time. 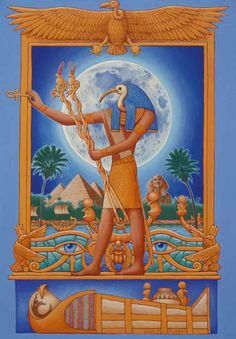 The great master Thoth, as described by the Children of the Law of One, incarnated as a human being on Earth many times throughout history, the latest of which was as Yeshua or Jesus of Nazareth. According to the teachings, in the beginning, humanity existed in a state of total unity with the universal spirit, wandering the universe as an etheric race of symbiotic beings acting as a singular unified yet individual collective of consciousness. A social memory complex as described by the Law of One is a good description of this more unified, holistic, and universally conscious state of communal beingness. Before the fall, the group came upon the Earth in a state of primordial evolution, and decided to lower its vibration to explore what was occurring here. But in the process of downstepping their consciousness and vibration, a progressive separation from the universal state of connectedness took place. The beings created material bodies based on animals found at the time, and gave rise to the first human-animal beings depicted by ancient cultures. These beings were not animal, yet not wholely human either, possessing incredible powers of mind but lacked the coordinating agency of universal consciousness, and as a result, many of these first wave humans fell into separation consciousness. They became enamoured with the sensations and experience of being in the flesh; and by way of choice, slowly started to fall deeper and deeper into separation and all the secondary states which come with it, such as selfishness, pain, suffering and so on. 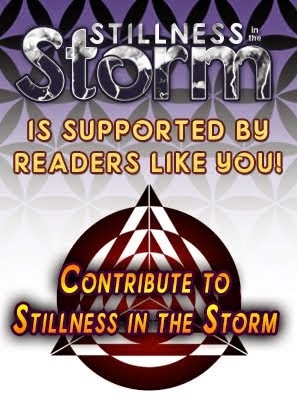 Those still vibrating at a high level, watched in horror as their spiritual compatriots lost themselves in the material realms of the Earth, and desiring to reunite with their fallen brothers, chose to lower their own vibrations to help the human-animals rise out of spiritual obscurity. This second wave was the modern advent of humans we know today, being more human than animal in nature, yet still susceptible to the trappings of the material world. The second wavers used a slower process of vibrational shifting to lower their frequency, and in the process the first set of biologically male and female bodies were born. Prior to this development, soul mates existed as a merger of two beings, but now that the polarization into the material realms was proceeding, separation of male and female took place. And within each of these newly created fleshly beings, a division within also occurred. The mind, which was almost totally unified insofar as intellectual and intuitive expression, began to divide into masculine and feminine attributes as well. What we know of now as the conscious and unconscious mind as well as the logical and rational mind vs. the intuitive and creative mind were once operating as a completely integrated singular system. Eventually, the down stepping was complete, and the second wavers were fully invested on the Earth as material beings in fleshly bodies. But in order to do the work of helping first wavers or the human-animals, they lost connection with the universal spirit. In an effort to maintain balance and universal consciousness, they devised what would later be known as the Teachings of Atlantis, calling themselves Children of the Law of One. Some of their order, tempted by the splendor of the material world, began using their free will to step further and further into separation consciousness, and this group became the first Sons of Belial. These Sons of Darkness, having lost their connection to the universe and as such their ability to perceive universal consciousness still had great powers of mind and manifestation, which they began using to enslave their second wave brethren and the human-animals. The Children of the Law of One were greatly saddened by this turn of events, realizing that separation consciousness was the primary cause behind all of the hardship that had befallen them. As such, they passed down the teachings and seeded all the worlds religions, taking refuge in the Himalayas and starting a place of learning known as the School of the Prophets. It was from this order that all the worlds major religions eventually sprang from, and were later corrupted by the Sons of Belial. Early in the history of this saga, the Children of the Law of One, after many eons of work, finally healed the human-animals of their aboration, yet the Sons of Belial were still lost, and what's worse, actively developing techniques to further their own separation from the divine. This is because one of the resulting effects of losing connection with the universe is the creation of a false version of self, the separate self, which eventually becomes selfish and destructive. The selfish separate self seeks to maintain its own survival at the cost of everything and everyone else, even if it means enslaving others in order to do so. And with the emergence of the selfish separate self sprang to life a culture and tradition that supported it, which has completely taken over all ways of life on Earth today. No culture or tradition is free from the trappings of separation consciousness that have become the standard for nearly every human being on Earth. And these ways of being are passed from mother to daughter, from father to son and from individual to individual as a norm of civilized life—only until recently were these ways of being challenged by newer generations. In the distant past, after nearly all the second wavers had succumbed to separation consciousness, the many incarnations of the great master Thoth, entered these twisted societies as prophets to offer teachings to the peoples now enslaved by the Sons of Darkness. The Belialians developed advanced technology which eventually caused them to destroy the Earth's fragile enviroment and further plunge the growing human race, now almost completely lost in separation consciousness, into greater degrees of slavery and oppression. Thoth, realizing that the Belialians would eventually take over the planet in an age of unprecedented darkness, caused the Earth to shift on it's axis and destroyed the advanced civilization of the Belialians in what eventually was known as the Deluge or the fall of Atlantis. Thoth later appeared to the Egyptians, and many other peoples, offering them wisdom and knowledge kept by the Children of the Law of One over the ages. It is these teachings which are encoded within nearly every religion on the planet as esoteric mysticism. The history provided says that the mystery schools were created by Thoth and his followers, which formed the basis of much of the esoteric knowledge described by Henry in this episode. But the plague of separation consciousness continued to hinder the human race, and eventually, humanity lost the ability to think holistically, and began using written language. The Bible refers to this as the time of the tower of Babel, when in ages of the past, man was united by a common language, but after the fall, each region had their own unique tongue. As a result, the capacity for holistic thought and interpretation of images and symbols was greatly reduced. This is one possible explanation for why the use of pictographic or ideographic languages eventually fell into disuse while more modern, and abstract, writing methods took root. The price for using abstract methods of thought is a greater plunge into separation consciousness, and as such, mysticism or the direct experience of knowing spiritual realities slowly degraded into an age of elite priesthoods and the power of organized religion. In times of old, shamans and mystics helped others make direct contact with spiritual realities via initiation. But now, the average person is encouraged not to communicate with the divine, and rely on priests and religious figures to do this for them. One last point regarding the history provided by the Children of the Law of One is that this time in history is the great shift, when all the past ages of separation consciousness will finally be healed. However, this process is not automatic, and due to the destruction already brought upon the Earth, and the choice of those to further separation consciousness, the shift will be painful and hard for many. It says that those who are on the path of truth should set aside all other distractions as the time of the great change is upon us, and the work of healing others by unselfish acts is very important. In short, the Sphere Being message to humanity is an almost perfect reflection of what is described in the Children of the Law of One history and narrative. The ancients used much more symbolism in their depictions of esoteric principles than we do today, probably because individuals possessed a greater capacity for holistic thought, contemplation, and analysis. Given that non-pictorial writing forms, especially in Egypt, emerged later in history, it suggests that older civilizations had more understanding of symbolism and it's power to activate consciousness; described earlier as a catalyzation of spiritual knowledge by the subconscious hidden within the unconscious mind. As on example of this method, consider Alchemy, which is an ancient form of spiritual or mental evolution hidden within an allegory of transmuting base metals into gold. Related The Theory and Practice of Alchemy - "it is the process of increasing and improving that which already exists"
Thoth or Hermes Trismegistus, according to the Emerald Tablet translations, states that he created the Tarot Deck using images of a deeply symbolic nature, employing archetypes within the images that subconsciously activate a person's mind when seeing them. He also says that he knew the images would be corrupted into mere parlor tricks by Egyptian fortune tellers, later known as Gypsies. Yet due to the rampant egoism and selfishness that was sweeping the Earth—and has since then completely taken over—the core teachings embedded within the images would remain intact. It appears the same tradition of encoding messages and information in art, with many layers of interpretation, also branched off into other cultures, which Henry features in his presentation. The fact that Hermes, Thoth, Jesus, and countless other prophets all have a similar set of core teachings, which are also conceptually congruent with the Sphere Being message to humanity, suggests that the same spiritual guardians, who are actually our brothers and sisters according to the Children of the Law of One history, are one and the same. The Blue Avians appear to be the prophesied return of the Christ or Christós, yet unlike the saviors described in modern day religious interpretation, are actually here to help humanity save themselves. In my view, the Children of the Law of One history and the fall of humanity, while potentially being mythical in nature, is wholly accurate for what has taken place. The truth is, humanity has enslaved itself by choosing separation instead of universal consciousness, and the Sphere Being message is centrally focused on restoring the balance by addressing the primary problem, the individual and their identity of separation. And if one reviewed the esoteric teachings hidden within almost all major religions, the same message of personal responsibility, healing and unselfish service of others is expressed. 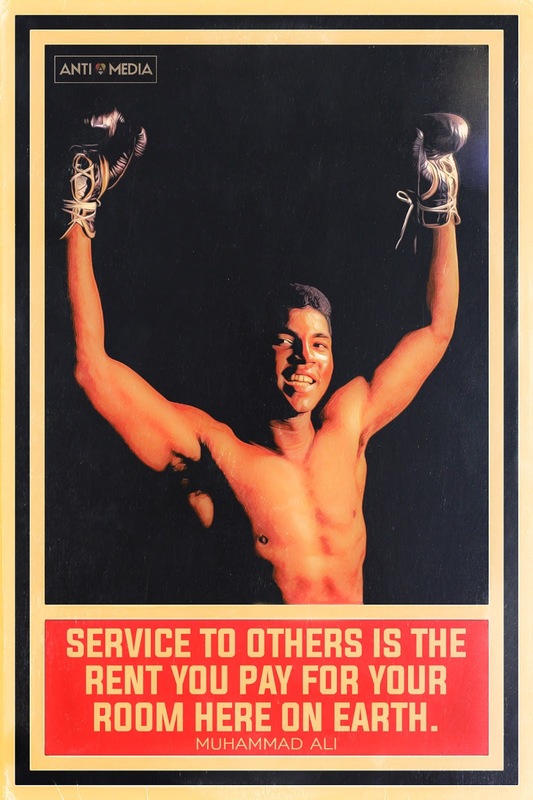 Even popular culture icons intuitively speak to these deep spiritual realities of interconnectedness and loving service, here's one example. The artistic works cited by Henry throughout this episode bolster this interpretation to a great degree and lend even more credence to the notion that humanity is currently living in the so-called End Times. But unlike what is normally called up in reference to that term, the thing that is ending is suffering, slavery and tyranny that has ravaged the planet for eons. And since all of these things were made possible because of separation consciousness, the only lasting solution is to personally take up the spiritual task of restoring universal consciousness within ourselves. In my personal view, nearly every insider, spokesman, truth revealer, blogger, researcher, channeller and so on all have the same basic core message, which is to become the change we wish to see in the world, yet in order to actually do that, we must face the truth about ourselves. The fact is, humanity has been led down the road of separation and many of our cherished cultural norms, traditions, and social practices must be examined as they cause new generations to fall into separation consciousness, just like our forefathers. The end of the old world means the passing away of many things we take for granted, and this can be disheartening for those who lack the length of sight to see the bigger picture. But thankfully our brothers and sisters lost in darkness are not alone, and we who see the light of truth have the power, and I would say the duty to share it humbly with our fellows. As one final thought in this grand topic, the Children of the Law of One teach that the best way to undo one's separation consciousness is through proactively servicing others, forgiving ourselves, and becoming shining beacons of harmless love for all. While sharing information and truth can be powerful catalysers for the mind, simply being kind and loving to our fellows provides a venue for the wisdom of unity to be felt. The fact is, most of humanity isn't ready for intellectual truths, and as such, compassion and kindness used first, prepare the way for the day when sharing more openly will be possible. So while sharing information or our truth is most definitely part of the process, if it is done without kindness or forced onto another who is unwilling, the effect only causes further division and separation. Instead, seek to develop a loving space where the mind blowing truths of our age can be received in a safe and secure environment, where we develop fellowship and compassion with those we are attempting to awaken. One day the masses will realize that the paradigm of separation, prolonged by generational indoctrination, has ended, and a new paradigm of truth seeking and restoration of universal consciousness is at hand. And it seems that in harmony with a great many prophecies, as outlined by Wilcock in his work—those with Christ consciousness, the Sphere Beings, and Guardians—have returned as promised to help usher in an age of light and life for all. I admit this episode helped me remember just how amazing this time in history truly is, and how grateful I am to be here and play a part in helping bring about an age of healing and growth. If Earth has been the central hub for a flurry of extraterrestrial activity for centuries, you would think that some evidence of their presence would have lingered through the ages. 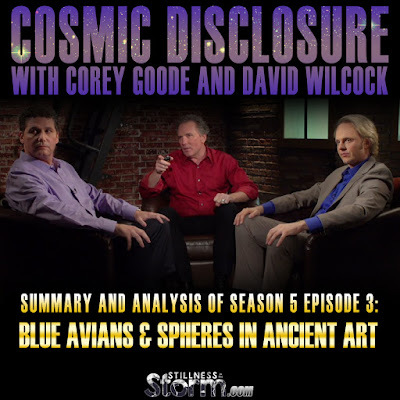 In this special presentation, William Henry joins the program to reveal imagery from historical works of art which corroborate Corey Goode’s testimony as to long-term presence of extraterrestrial beings. From ancient Egypt and Tibet into the heyday of Christian art, we will find depictions of the blue sphere beings and blue avians as benefactors to humanity. This interview with David Wilcock was originally webcast June 7, 2016. DW - Alright, welcome to Cosmic Disclosure. I’m your host, David Wilcock. We’re here with Corey Goode. We have a special edition for you here with the legendary William Henry. Now, I’ve been familiar with William Henry’s work since the late 1990s. He has been extremely consistent. I’ve gone all over the place. I’ve talked about everything you can imagine: Illuminati, UFOs… William has always been focused on ascension, focused on Christ, focused on the true core of what the message is that we’re all ultimately here to convey. And William has really done an incredible amount of work unlike anybody I’ve ever seen in terms of looking at art and seeing some really, really provocative stuff. When we found out the information that William had and the corroborating power that brings to Corey Goode’s testimony, we said, “That’s it. We’ve got to have him on the show!” Wait till you see the stuff that we have in this episode. It is going to blow your mind! So William, how are you doing, buddy? DW - Can you just give us a little take on your idea of ascension? What is ascension? WH - Well, I always take people back to the story of the caterpillar and the butterfly. The idea is that we’re all living in a pupal phase in our human body but within us is an ascended phase, a next-level: the butterfly. And the problem is we’re kind of like that cartoon I saw once of the two caterpillars looking at the butterfly and another one flies by and they say, “You’ll never get me up in one of those things!” Right? We don’t have a concept of what it means to ascend. But simply, it means to become a celestial traveler, a cosmic being. [It means leaving] behind our caterpillar phase and morph or phase into an ascended form. As you said, I’ve really studied the art of ascension and they’re almost always show it the same way. It’s a humanoid form, a light being, a luminous, radiant being, often shown in a sphere, a sphere of light. And that sphere indicates a portal. It indicates an ascension vehicle of some kind that ultimately manifests from within our own body. [Hugues Prévost Notes: WH’s words takes me back many years ago when I had a profound lucid dream experience as a teenager. I found myself flying over an incredibly beautiful coastal landscape that appeared like the Earth but at a much higher level of frequency. As I landed on the beach, I saw the most wonderful being I’ve ever seen to this day hovering nearby above me. Just a WH describes, it was humanoid but made of light with an intricate pattern of all the colors of the rainbow. DW - Now, do you think Corey’s crazy? I mean, what’s your opinion on all this stuff? WH - I hear his story and immediately I am getting resonance with what I know from the ancient world. It doesn’t sound crazy at all to me because I know Blue Sphere beings exist. I know Blue Avian beings exist in the ancient record. Whether they’re actual beings or mythological beings, we can’t answer for sure. But however, humanity has been… I could use the word “obsessed” with angelic beings for many thousands of years. And very often in this ancient art, they are portrayed as blue beings, and often feathered or avian-type beings. They are Blue Avians! DW - Now, some people have accused Corey of just coming up with this elaborate story that has no precedent. So what I’m hearing you say is that there is a historical precedent for this. WH - Exactly. And when I first heard about Corey’s story, that’s exactly what I got. [It was] like, “Wow, there’s resonance here!” This is not something that you’re pulling out of your imagination. This is something that has been in the human imagination for a very long time. DW - What is the relationship, in your knowing, between these Blue Avian type beings that you see in the art and ascension? WH - The Blue Avians are teachers. They are the bringers—the light bringers if you will—of the mystery teachings of ascension. <DW: Hmm!> And when we look to these beings, we’re looking to them as benefactors of humanity. You could go [so far as applying] “savior” [to them] but that’s a whole other category of beings but [more accurately they’re] benefactors. They’re wisdom-bringers. They’re trying to get us to wake up to our soul’s potential of what is really within us and our ability to leave the Earth if we choose, and travel the cosmos. CG - And you said you’ve been researching this specific topic since 2002, correct? WH - That’s correct! [I came upon this topic] through my study of mystic Christianity. I started researching the ascension stories of Jesus. In the Bible, it clearly says that Jesus ascends in a cloud, and that furthermore, when he returns, he will return that same way: in a cloud. But when you go over to Christian art, yeah, you will see a cloud. You will see him standing on a cloud, like the Buddhist cloud-riders, for example. But more often than not, there’s a precedence for his ascension taking place in a blue sphere, where he is even portrayed as a blue being. And he is ascending into the stars through this blue sphere or returning to Earth in this blue sphere. It’s clearly some kind of a transportation vehicle. [Hugues Prévost Notes: WH’s information fits very well with what Marc Brinkerhoff claims to have seen and experienced directly himself. When I first came across Marc’s wealth of knowledge, I was struck by the numerous similarities with CG’s testimonies. Marc describes this sphere vehicle as “soul travel,” which is required to reach realms of existence much higher than the usual astral planes most people go to during sleep or in out-of-body projections. DW - Well, let’s dive out of the plane and parachute into this, because you have such amazing data. I don’t want to rob any time from it. DW - What have we got to look at first here? WH - Okay. Let’s go back to the Temple of Horus in Egypt. It’s in Upper Egypt. It’s on the Nile. [It dates back to] 300 BC. And this what we’re looking at here. We see the exterior walls of the Temple of Horus. WH - And etched on the wall are these amazing depictions of Horus as a bird being. Now the key thing is that very little color remains at this temple. 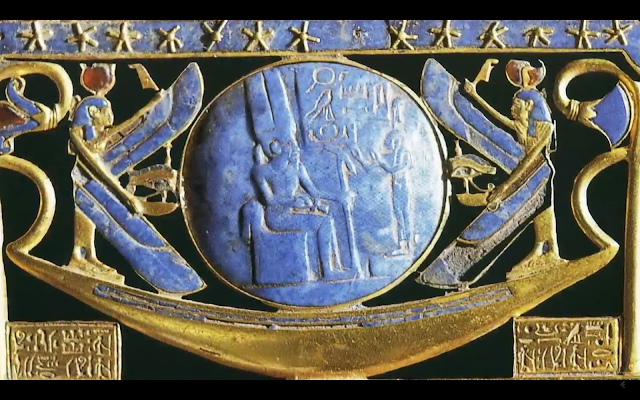 But when you zoom in on it, as I have here, you see that Horus is clearly a blue being. DW - There’s definitely some blue below the chin and above the eye. WH - Exactly. <DW: Right> And you can say, “Well, okay, somebody added that later.” Whatever, there’s really not a history of Horus being a blue bird being: a Blue Avian. 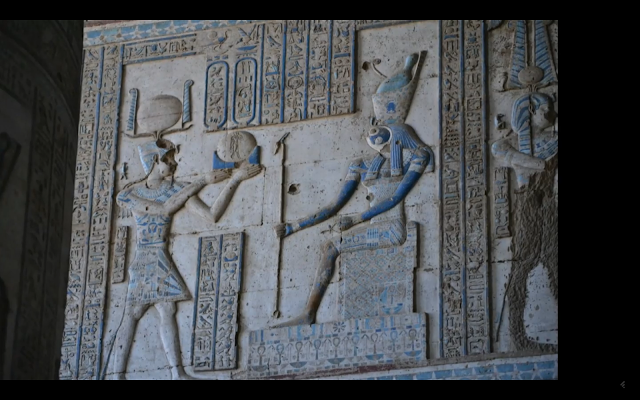 So let’s go over to the Temple of Hathor at Dendera, which is nearby, also built at the same time. WH - And what we see in the Temple of Hathor is this incredible depiction of Horus enthroned with a feathered cloak indicating he is a bird being. The bird symbolism is very apparent here. He’s on his ascension throne, which means this is a throne that he can travel into the stars. He’s clearly a blue bird being, a Blue Avian in our context. DW - Now Corey, what we see carved here does not look exactly like what you saw? DW - But William, are these people—these are not eyewitnesses [who] carved this? This is like based on a legend, you think? WH - These are… Well, it could be both. We never know where the artist got the inspiration. Did this artist at Dendera see a blue Horus or was told what to carve by some elder being? There is precedence in the text for the description of these beings in this way, but it’s open to interpretation about exactly the source of it. DW - But the core is: we have a human body <WH: Yes> with a bird face [who’s] blue! <WH: Exactly] Which is insane! This is crazy. WH - Totally. And when you look at Horus here, as I said, he’s on his ascension throne. You have a human figure that’s offering a symbol for the soul, as well as gateway to him. Horus has several very important tools or implements in his hands. WH - In his right hand, he holds this very long stick that’s a resurrection [staff]. It’s used for opening the gates of heaven. In his left hand, he hold the key of life. Now Corey, take a look at that resurrection stick and look at the bottom of that. What do you see? CG - It looks like a tuning fork or some sort of resonance… device. WH - Right! It looks like some kind of a tuning fork or something: same as the key of life. These could be puns, but it could also be that this is some sort of a vibrational technology that he’s demonstrating here. Image Source. 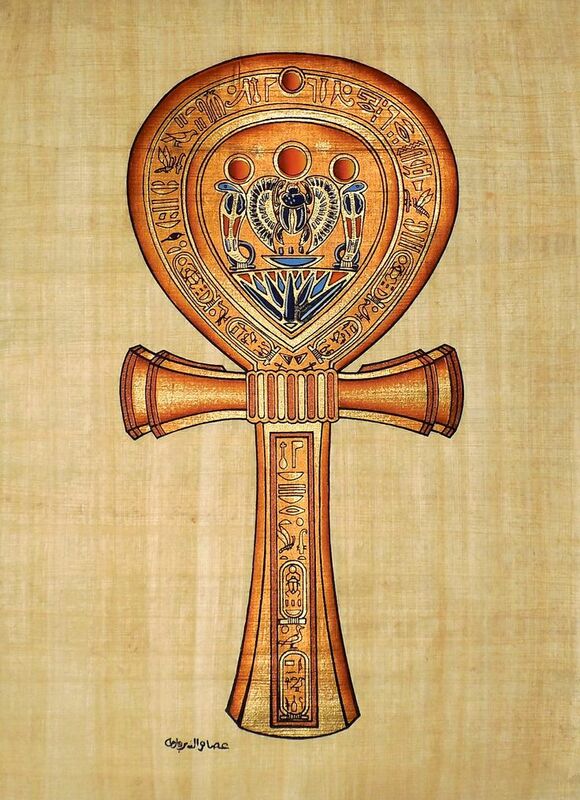 Artist depiction of Key of Life or Ankh. Image Source. Artist depiction of Thoth holding the Key of Life and Resurrection Staff. CG - Looks like a very subtle hint at something. DW - Well, and we also know from some of the Wisdom Teachings episode I did that the bennu bird on the top of the staff is actually the head of a pteranodon. And it appears that occasionally, these dinosaurs go through portals, and they portal into our time. The Egyptians saw that they enshrined that on the stick. So it does seem to represent ascension, portals, all that stuff, because of this pteranodon head on the stick. WH - [It is] very peculiar that they would have that kind of design and we can match it up to our eyes with what appears to be some kind of a dinosaur that shouldn’t have been in this scene. And so here we are looking at a benefactor, a teacher of humanity, who is saying, “I’m bringing you the key of life. And I’m also offering you a teaching…” maybe a vibration that opens up some kind of [celestial] transportation vehicle. CG - Love and forgiveness. WH - That’s what opens the gateways. DW - Are there any other points of continuity, William, that we’re going to see between this design and some of the other ones, in terms of what he’s sitting on or what he’s wearing, [or] anything like that? WH - Pay close attention to what’s in their hand. <DW: Okay> There’s very often going to be a stick. And pay attention to the throne that they’re sitting on. DW - Can you back up so we can look at that again real briefly? WH - Yeah, take a look at that. DW - Okay, what have we got here? DW - Or actual feathers. WH - Right, or actual feathers. And he’s on a throne. Other examples of this throne with actual feathers on them. Osiris sits on a feathered throne, because the idea is that it flies. This is how he comes and goes. And rather than showing a big spaceship or something like that, they’re going to show us a simple throne. The technical term for it in mystic circles is the Merkabah throne-chariot. This is the throne these beings sit on and they ascend on this throne. They come and go on this throne. WH - Look at this example. This is extraordinary. WH - We’ve got a pharaoh on his throne holding our key tools or implements: the stick, the key… And he’s on a boat, a ship. It’s called, “the Ship of Eternity.” The “Ark of the Millions of Years” is the term they use for it. The Ark of the Millions of Years! I mean, what does that say? CG - That says a lot! DW - And it looks like the guy on the left is a lot larger than the person on the right. And one of the things Corey [said regarding] the Blue Avians, [was that] they’re taller than us. DW - So that could be a connection. CG - Yeah, it could be! WH - Yeah. So we’re in a blue sphere here. We have a blue being and a blue sphere. This is a Blue Sphere being, okay? [If we’re] putting it together. DW - It is crazy. I mean, look at that: this is a gorgeous lapis lazuli stone. WH - Yeah, and gold. And along the top, notice the line of stars along the top. WH - That’s the Egyptian hieroglyph for heaven. 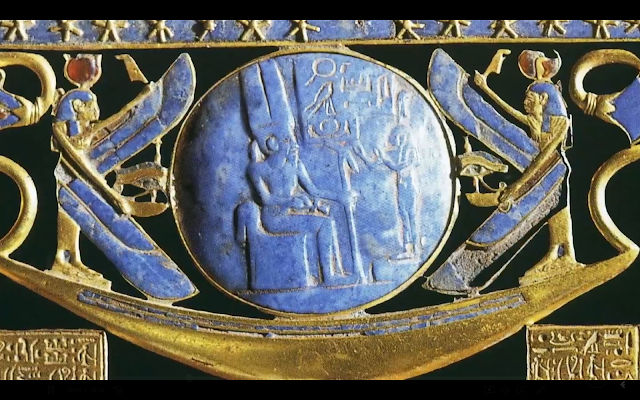 So this is saying this is a heavenly being sailing his Ark of the Millions of Years on his throne in his blue sphere. WH - It actually looks like a wormhole. The lotus buds on each end look like the mouths of a wormhole. WH - So this is a wormhole that this guy is traveling through. He’s a happy camper. This is the goal of all human ascension quests. You want to get on that seat. DW - And Corey, you’re actually traveling in these blue spheres when you go out there, right? CG - Right, correct. Yes. They will appear in a room, zigzag around, stop about this far away from me, wait for me to indicate that I’m ready, and then pfft! They expand and I’m inside! WH - There you go. We’re going to talk about that as we go because that is the key experience that all of us actually are capable of having. We can get ahold of one of these flashes of blue light and open it up into a blue sphere, and enter into it and travel. But let’s go forward here three hundred years now. Let’s leave Egypt and now let’s look at what we have here on the left. DW - That’s crazy! <Laughs> There’s wings. There’s something that looks like a blue sphere. There’s all kinds of radiants around it, like layers of a portal or something. WH - Yeah, this is the Last Judgment scene. This means it’s the Second Coming. So Christ is returning. He ascended on the cloud and the Book of Acts says he will return the same way he left: on this cloud. It’s blue. This is Fra Angelico’s painting [during the] Renaissance. You have Jesus sitting on his ascension throne surrounded by this mandorla or almond-shaped gate of light that is surrounded by blue angelic beings, blue birds. WH - Yes. He was one of the benefactors of the Medici family. They had spent the equivalent of $50 million in contemporary dollars seeking the secrets of ascension. WH - [This is] called the Corpus Hermeticum. They decoded this and then they went to [the painters] Sandro Botticelli, Michelangelo, Fra Angelico, and they said, “Okay, here’s the key codes of ascension. We’re going to have you hide these in your art.” And that’s what they did. CG - That indicates to me that these mystery school initiates must know about Blue Avians. WH - They have to. They absolutely have to. Any mystery school initiate, as we’re doing here and we’re just looking at the first layer of this image, so that we would be able to say, “Okay, that almond-shaped gateway, that’s a portal.” It’s held open by Blue Avian beings. They’ve been coming and going to the Earth plane for many thousands of years. 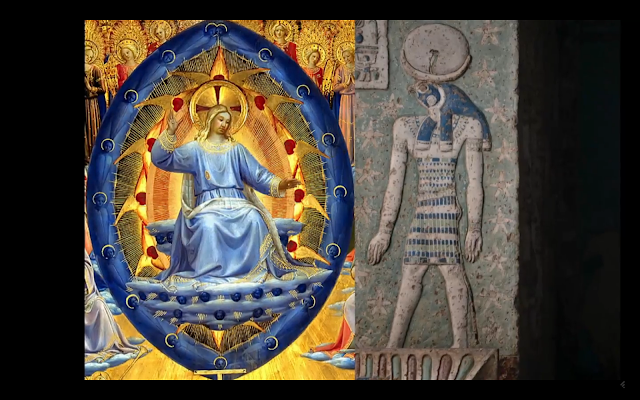 And now we have Christ as the new Horus, as he’s referred to, connected with the Blue Avians and celestial travel. WH - He’s coming and going from the cosmos in this portal or gateway, surrounded by these blue beings. And it tells me that he is part of that same mystery school. That’s what we’re looking at here. CG - I think many of us may have seen these images but never would have made this connection without the research. WH - Yeah. Your ordinary Christian or other person’s going to look at this and say, “Oh, there’s blue angels around him.” If they get that far. They might not even see them because that’s how they hide it in plain sight. You don’t at first see that he’s surrounded in a gateway composed of these beings. DW - And Thoth is one of these Blue Avians, right? WH - Well, you can—you will definitely see him as a bird being with an ibis head. <DW: Right> I don’t know [if] I have an image of him blue… <DW: Right> But he won’t necessarily have to be blue to be connected with this bird tribe. DW - [He could have been an] Avian human. WH - Exactly, exactly. So the first time I went to Egypt, I’ll never forget the guide saying Christianity is the Egyptian religion. I’m like, “What are talking about? You’re muslims. You’re Arabs.” And then about the third time I heard it, I got it. Christianity is the Egyptian religion, updated with now Christ as the new Horus. And the mystery teaching is all in the mystic side of Christianity: the gnostic side which came out of Egypt. I mean, Christianity came out of Egypt. The one thing the Catholic Church has done is try to sever that connection with Egypt. Because once you follow Jesus into Egypt, now all of a sudden you’re confronted with this type of thing and all these mystic ideas. CG - Too many questions come up. DW - Well, William, I’m also remembering sitting in at a lecture that Graham Hancock gave in which he was describing the Egyptian spiritual teaching. And in the Egyptian spiritual teaching, you have a heart and a feather on a scale <WH: Yes> and it says your heart has to weigh less than the feather to be ascended. Image Source. 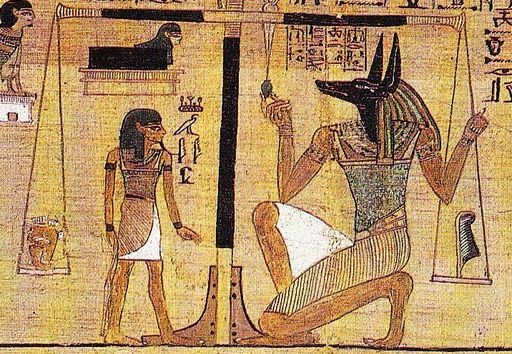 Anubus on right judging the soul by comparing the weight of an innitiates heart against the feather of Maat, the deity personification of the Universal Spirit or the All in hermetic philosophy. The same general theme of soul judgement is rendered in this image as well. WH - And this indicates that this being has passed the Earth test. His heart is lighter than the feather. He’s a pure being. And that’s the only way he gets to sit on that throne. He’s got a pure heart. He’s a being of light and love. DW - So when we get back to this Renaissance art now, are you suggesting that the mystery school tradition from the Medicis, that they might have some secret documents that they didn’t allow people to see, [and which] have images like this in them? WH - Definitely. There’s no question about it, because what they knew—what they determined from their study of the Corpus Hermeticum, which they got from Egypt and believed as the original mystic Christian teaching—is the power of the image. 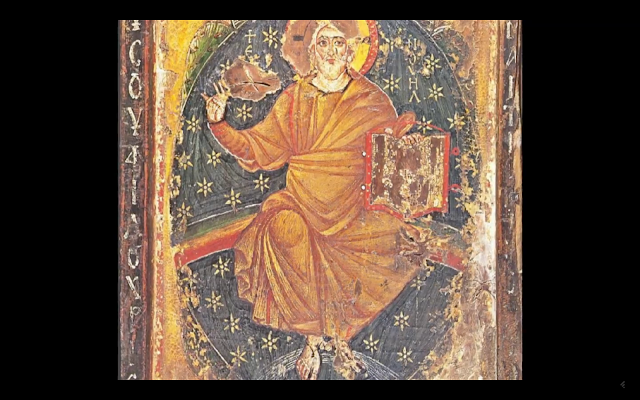 The Corpus Hermeticum has a very important phrase, “The image will show you the way.” So they were very, very intent on encoding images with this power that will trigger memories, trigger connections that you can make. You start connecting the dots. You know, when I was a kid, [there were] “Highlights” magazines, right? I’d sit on the floor, and there’s that one page: Find the fifteen items that are hidden [in a picture] and there [was] a list. WH - You could spend hours! I did anyway. <Laughs> Well now, that’s all I do as an adult. I look at art and find the fifteen hidden things in the art. But the thing is, the list isn’t there. The Medicis had the list because they put all the stuff there and other initiates had the list, but we have to find the list. And that’s kind of what we’re doing here. CG - We have to decrypt it without a key. DW - I’m kind of hearing you say something similar to the concept of gnosis, where information is alive. And if you’re exposed to that, it starts to trigger this metamorphosis in you. WH - Totally, totally. 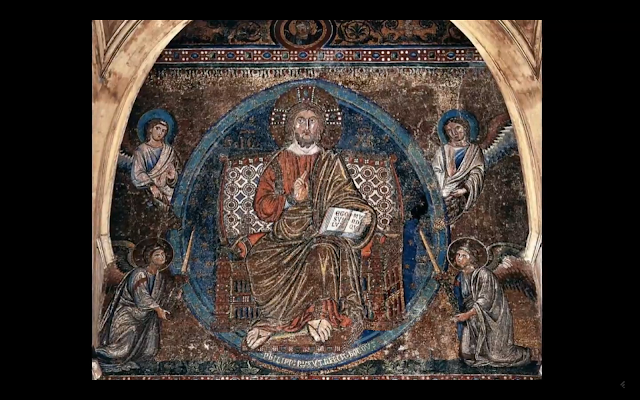 So actually, images like this that we’re looking at here of Jesus on his throne of ascension, this is not a static image. This is actually to the mystery schools a portal itself. They want you to enter into this scene. They want you to figure out what you’ve got to do up here and in here, in order to take this ride on this blue sphere. It’s the whole game of Earth life. This is the ascension sphere. And you know you’re ascended when you’re in the blue sphere. Maybe these angelic beings like we’re looking at here are surrounding you. It could be Jesus himself who’s sitting beside you, who’s come back to assist you in your ascension. WH - Yeah, well it’s a vital image and message for us to get today. Because we understand now today. We have the concept of stargates and wormholes and interstellar travel. We know there’s a whole physics behind this now. And that’s what encoded in these images: this whole interstellar physics that’s really a new spirituality. I call it, “stargate metaphysics.” And that’s what we find in Ancient Egypt. That’s what we find in Christianity [and] Buddhism. Islam has it as well. DW - Not to mention so many people having near-death experiences seeing beings of light come around them with these spherical auras around them. WH - The tube of light of the near-death experience is a wormhole. <DW: Yeah> We can pretty much put that one on the table and say, “That is a fact.” But there’s more to it than that. I mean, we know that the wormhole exists. And we’re all capable of ultimately opening a wormhole from within us. And that’s the idea in these images. I mean, look at this. You’ve got Jesus on this throne. He is in a blue sphere. And the sphere is filled with stars. DW - That throne is not attached to the ground, right? He’s levitating there. WH - No, he’s levitating. And so I have kind of a Forrest Gump mentality sometimes. When I see a ring of stars or a gate of stars, I go “stargate.” This is a stargate that he’s in. Or let’s put it this way, more comfort level for people: what if Jesus is a stargate-traveling, time traveler, and that’s what the blue sphere is? What if? CG - There’s too many different artists doing the same thing. WH - You know how we know that? The artists are often unknown. The author’s like, “It’s not about me.” “It’s not my greatness.” It’s about the message here. So the artists are unknown. DW - Okay, so William, when we’re looking at these four angels around Jesus here in this blue sphere, who are they? What do we know about them? WH - They’re archangels and they’re the guardians of the throne. Sometimes they’re symbolized by the lion, bull, man, and eagle, which are the four primary symbols of the evangelists and the four directions and so forth. But their primary role is to indicate to us that this is happening in the heavenly realms and this is the power of flight or ascension that’s being indicated, an angelic superpower. DW - And I believe the word “angel” in Greek is ángelos (ἄνγελος), which means “messenger. WH - Messenger, right. Yeah, exactly. DW - So Corey, he’s saying guardians. He’s saying messenger. What is this conjuring up for you right now? CG - And earlier, he said teacher. So it reminds me of many people who are having experiences with blue spheres. They’re seeing blue spheres that appear in front of them. And sometimes they consciously remember or recall getting information from the sphere. So these spheres are imparting knowledge and information to them. And it’s always about them growing and changing on the inside. WH - Right. Yeah. I covered this in an episode called “The Blue Sphere of the Soul” in my show, The Awakened Soul. CG - Have you heard of blue spheres visiting people with messages? WH - Yes. It’s so vital. There’s an Indian guru named Swami Muktananda. CG - Yeah, I’ve heard the name. WH - Or you can enter the blue sphere and travel through it. CG - Is this in one of his books? <WH: Uh-huh> Oh, wow. WH - Well, this is really trippy because we’re taping in Boulder, Colorado. And I was on a train after I graduated college to come out here to Boulder to try to apply to Naropa Institute. And while I was on the way here, I met two guys who were devotees of Muktananda. <WH: Wow> And one of these guys had gotten sick of being in the ashram and didn’t want to do it anymore. And he’s down at one end of the hall and Muktananda’s at the other. And Muktananda shows up and puts his hand out like this and this ball of blue light shows up in his hand. And Muktananda throws it at him. It hits the guy and he goes into spasms of ecstasy. He’s literally spasming on the ground… This is the guy on the train telling me this, personally. It just randomly happens, right? And then Muktananda comes up and says, “So now you will be happy and enjoy being here, huh?” And he’s like, “Yes, yes, yes!” And after that, the guy was just sweeping and cleaning and doing all kind of stuff. CG - The experience is for everyone. DW - You’ve mentioned The Awakened Soul. You said that’s a show? WH - Here on Gaia. <DW: Okay> It’s The Awakened Soul [with] thirteen (13) episodes. [It’s about the] lost science of ascension. We start from the very beginning. I try to provide a historical context for the idea of ascension, going back into history and saying, “Hey, we’ve been talking about this for a very long time.” And so let’s look at the history of it. Let’s look at the art. 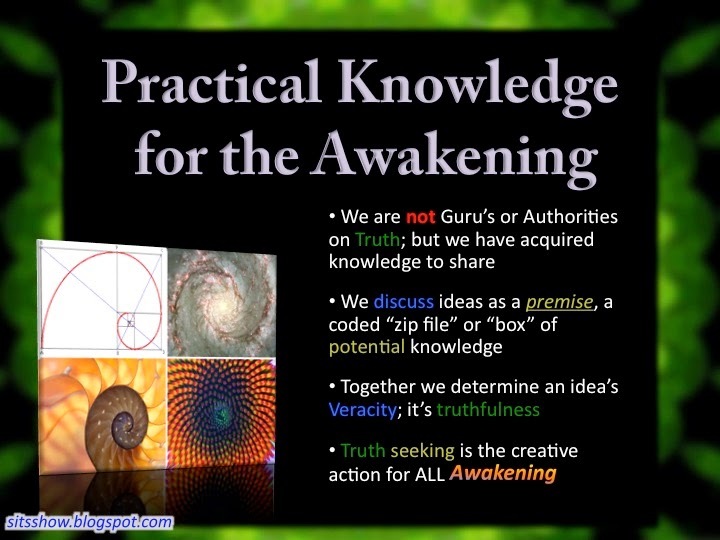 Let’s stair-step into it so that we can see that a lot of people… You hear the new-agey term, “I’m a starseed.” Right? <CG: Right> And it turns a lot of people off. But a lot of people don’t know that [this] term was invented by the Stoics in Ancient Greece, 200 BC, <CG: Really?> [when] they started discussing our soul as a star seed. CG - I would assume that it’s more a New Age kind of term. WH - Right, and that’s part of the point of The Awakened Soul. [It] is to say, “Hey guys, this conversation we’re having has been going on [for] a very long time. Let’s bring some historical documentation into it. Let’s put some art with it, and let’s show how we all can do this. CG - That’s going to be interesting. WH - Yeah, so I’m really excited about it. So thank you for mentioning that. DW - Well, let’s see something else. What else have you got in your bag of tricks here? WH - Let’s go to the fourth century AD. This is from Egypt. I took this image from the Coptic Museum in Cairo, Egypt. The Coptics are Egyptian Christians. They believe [that] they have the original Christian story, which is different from the view most people understand today. 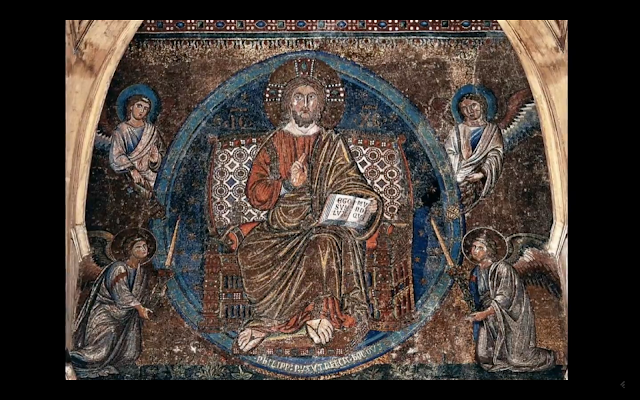 But the key thing is, look we’ve got Jesus sitting on a throne holding a book in a blue sphere. This is an ascension scene. DW - Just for the sake of the skeptic, is it possible that all of these guys could have seen each other’s artwork? Or are they too geographically isolated? WH - They are geographically isolated. [Yet] it is possible [that] someone went to Egypt in the fourth century or so forth and saw this. And [then] they duplicated it. But the idea is that this is part of the Christian documentation. This is what they say this is the experience. And this is corroborated then by other people who’ve had similar experiences such as yourself <gesturing towards CG>. CG - And back then, art was rooted in tradition. WH - Right, and people were going to stick with the tradition, too. They aren’t going to veer off and try to come up with their own interpretation of it, because it’s sacred. DW - Well, [there’s] something [else that] I’m thinking of too, William. It says in the Bible that Jesus would only speak to the masses in parables. <WH: Right> But then to his disciples behind the scenes, which you don’t get to read in scripture, he’s saying things that are not in parables. <WH: Right> Do you think this is part of the undisguised teaching? WH - I think this is part of the secret teaching of Christianity <DW: Okay> because your average ordinary Christian has probably never seen images like this. And there’s a reason for that because this is for the initiates. CG - Yeah, I was raised Christian and still consider myself a Christian, and I have not seen most of these images. WH - Right, and because the Church hierarchy has said, “Okay, we’ll just keep that over here, and then maybe people will discover it on their own.” So looking at this image here, it’s really provocative because you’ve got Jesus in the blue sphere. And notice the concentric rings. As a symbolist, when I see concentric rings, I’m thinking two things. I’m thinking sound or vibration. Sound rings: “Whoa, whoa, whoa…” <mimicking a vibrating sound>. CG - And it goes back to that tuning fork. WH - Exactly. It goes back to the tuning fork, the key of life. And I’m also thinking portal, vortex, gateway, wormhole. Okay? And so here we could read this and say, “Alright, this is Jesus on his throne in a vibrational gateway,” obviously exuding light and love. And he’s traveling through the cosmos. And now we add in this image these counter-rotating rings. That torsion field. What are we talking about here? CG - And it also could be he’s a higher vibrational being, and it could be vibrations emanating from him, as well. WH - See, that’s the key point too because these are super high-vibrational beings [who] are beyond our normal perception. So they need some manner or vehicle to slow down so that we can perceive them. And perhaps that’s part of the function of the blue sphere. It’s certainly the function of that throne, because I’m going to give you a real esoteric secret here. That throne with his feet on the footstool, that’s the Ark of the Covenant. Christianity is supposed to have dispensed with the Ark of the Covenant because that’s an Old Testament image. And Jesus doesn’t need the Ark of the Covenant. CG - Right, the new Covenant. WH - Right, new Covenant. But he’s got his feet on the footstool. And the footstool of God is the Ark of the Covenant. It’s the Earth and the Ark of the Covenant. So what if the Ark of the Covenant then is some kind of a device that slows him down so that we can perceive him? Because otherwise, he’s moving too fast and completely out of our range of perception. CG - And in the Old Testament, the way it’s described it sounds like a device. WH - Absolutely. There’s no question, it’s some kind of a device. DW - Well, the storming of the walls of Jericho, they use the Ark and they blow the horns, and then the walls turn into mud. The stone just goes into liquid, and it falls down. CG - They used vibration. WH - Yeah, definitely. But here again, we’ve got the throne and the blue sphere together. 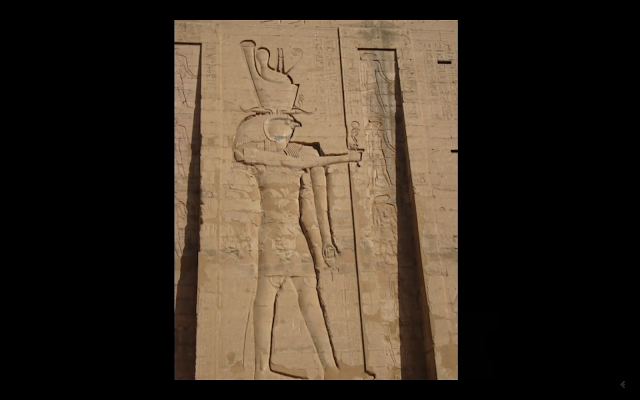 This is the Egyptian image from the Blue Avians. And then I call my father. And he’s on the other line with my brother, so we get into a three-way call. And my brother then explains that he had seen a blue sphere in his meditation. <WH: Wow> And this thing shows up. It’s just hovering in the room, and then it goes up to the ceiling, and it spreads out into a vortex that looks just like that. The way he described it was [that] it was brighter on the edges, and it got bluer towards the middle. CG - When he told me this, I was shocked. WH - There you go, there you go. WH - Right. So here’s the detail here. I mean, he’s got the book the Book of Knowledge. WH - It’s the book about, “Hey, this is how you do it.” And he’s got the breastplate. He’s got the cross right there at the breastplate, which indicates the open heart chakra, right? <DW: Hmm> And he’s giving us a blessing here. So if we are sensitive and attuned, we’re really locking onto the symbolism and saying, “Okay, he’s inviting us to open the blue sphere within ourselves, or to invite a blue sphere into our awareness so that we can have this experience. CG - This is amazing. DW - Well Corey, what’s the connection between—because we’re kind of dancing around this. We haven’t quite hit it, though. What is the connection between the message of Christ and the Blue Avians and the Sphere Beings, and even maybe let’s toss in the people from the inner-Earth, the library conversation you had with Kaaree. How does this all thread together? CG - Well, their message is all about forgiving others, forgiving yourself, to constantly strive to be of service to others, and to raise your vibration—to focus the light inwardly, you know, to pull the log out of your own eye before you start reaching for the splinter in other people’s eyes. And that sounds like the tenet of most of the religions. WH - Yeah, absolutely. What I get out of that message from you is that, “Hey, this gives us additional motivation to actually do that.” Because now you know that, “Hey, you’re not living a life of service just to get a reward.” But if you know that this is the reward, it’s going to really motivate you, I think. CG - Yeah. Let’s see some more of these images. These are amazing. WH - Great, okay. So this is Mount Sinai. We all know the story of Moses and Mount Sinai. 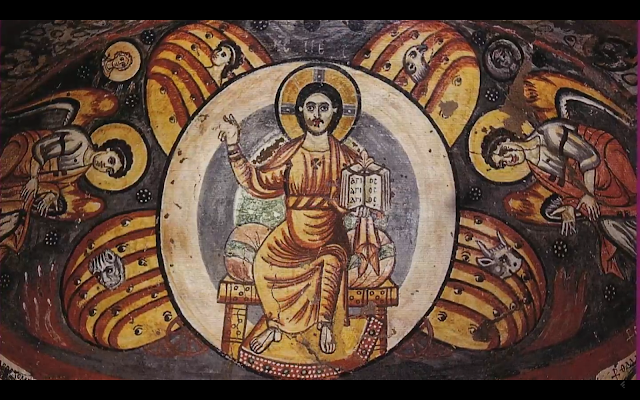 There’s a beautiful monastery there where they started developing a lot of this early imagery. And here we have the ascended Christ on a rainbow bridge in a blue sphere filled with stars once again. So this is obviously another portal or gateway indicating that he’s traveling through the celestial realms. DW - And you’ve said in other stuff—and I covered this in Wisdom Teachings a little bit—when he’s sitting on the rainbow, what does that mean? WH - That indicates that he’s in what’s called the rainbow body of light. That’s the Tibetan term for it. The Christians call it the “glory body,” the Resurrection body. It’s the butterfly I referenced earlier, the next level of human evolution. Within us is this lightbody that is portrayed as radiating rainbow-colored light. And so anytime you see Jesus sitting on a rainbow or enfolded within this rainbow light, that indicates that he is in his glory body, which is a pun on—the word “glory” means to glow rays. So he’s glowing rays here. He’s in his lightbody form. DW - Well, it looks like he’s standing on a blue sphere. WH - It does. There is that second blue arc beneath him, which again is the footstool idea. But again, stargate traveling, possibly time traveling. DW - Can you just tell us again, what do have—what’s new and hot here on Gaia that you’ve got to offer? WH - The Awakened Soul. It’s thirteen episodes [on] the lost science of ascension, where we’re going to take people through this incredible history of ascension, with also practices involved as well referencing many different traditions: the Christian, the Buddhist, the Egyptian tradition, the Divine Feminine—and how they all view this idea of ascension, and how we can make it a reality for ourselves. CG - I’m really glad this was brought to my attention, because I mean, like I said earlier, many of us have seen some of these images, and we never would have put this together. WH - Yeah, well thank you. I mean, it’s a powerful story. It’s, I think, the message for our time, that we can all raise our vibration in this way, and perhaps take a ride in one of these blue spheres <smiling>. DW - Alright, well that’s all the time we have for this episode. I hope you’ve enjoyed this as much as we have. I’m David Wilcock. We’ve got William Henry and Corey Goode here, and we thank you for watching. Click here for a Summary and Analysis of Season 5 Episode 4.